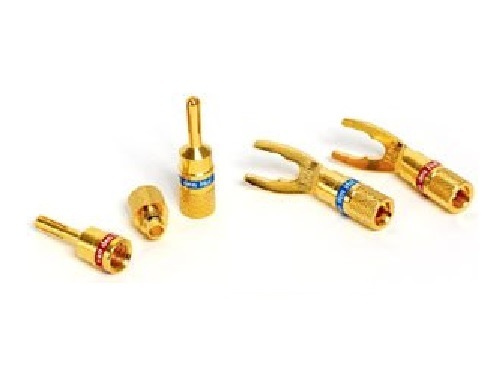 Versatile and easy-to-assemble DIY gold plated connectors. They offer high quality contact over long periods of intensive use and are very effective in keeping oxidation away. The banana and the angled fork spade screw-on terminals are WBT binding post fitting. Both offer excellent mating properties and minimal contact resistance. Angled fork spade terminal fits studs from Ø 6.0 mm to Ø 8.5 mm. Try our special contact fluid The SOLUTION on the strands before mounting the banana pin/spade blade part.